Memoirs of the Phoenix: Shatterings by Reece Harris ’55 (Outskirts Press, 2011). The myth of the phoenix has resonated down the ages from the priests of ancient Egypt to the settlers of Arizona. If the phoenix were to write its memoirs, it might wrestle with subjects such as how death preserves and enhances life; how the American Indian Swan-Woman wove the first basket; how the first poem rose up from Dawn; how problems of translation reveal secrets about the roots of language; and how geometry came to be. 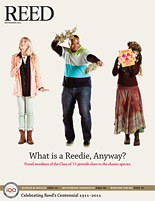 Reed and Reedies are mentioned at least 23 times in The Portland Red Guide, the definitive account of the Rose City’s crimson history by provocateur Michael Munk ’56, now published in a second edition by Portland State University’s Ooligan Press. Robert Mann ’60 has published two e-books on the Kindle: Managing your Anxiety: Regaining Control When You Feel Stressed, Helpless, and Alone and The Candy Butcher: A Gothic Tale. He is currently working on The Handbook of Fearlessness: Outgrowing Panic Attacks and Fears. “The Evangeline,” a short story by Linera Lucas ’71, was published in the Boomtown anthology. The story is set during World War II and recounts the rescue at Dunkirk from the perspective of a woman boat captain and her female crew. Read more about Linera’s work at lineralucas.blogspot.com. 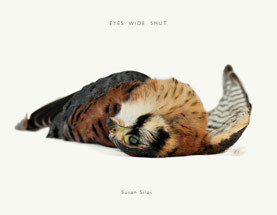 Susan Silas ’75 has published eyes wide shut (Horned Screamer Press, 2010), a portfolio of 24 archival ink jet prints reproduced in book form, which is part of an ongoing series found birds, 2000–present. The book includes two short pieces, “Found Bird” and “Bird of Prey,” and is available at www.susansilas.com. Bones Beneath Our Feet: A Historical Novel of Puget Sound by Michael Schein ’76 (Bennett & Hastings, 2011). A moving historical epic of the conquest of Puget Sound by the “Boston” tribe; it is lyrical fiction, deeply rooted in the people and events. The book resonates with tenderness and betrayal, misunderstanding and fear, greed and sacrifice—all the richness and grit of life. Michael is also the author of Just Deceits: A Historical Courtroom Mystery (www.michaelschein.com). James Freeman ’78 has published his 17th book, Irish Wake: In Loving Memory of Us All (PublishAmerica, 2011), a collection of 10 interwoven short stories. Royalties benefit students at Bucks County Community College, where James has taught ethics, creative writing, and composition for nearly 30 years. Just Trust Me: Finding Truth in a World of Spin by Randy Kasten ’78 (Quest Books, 2011). Randy examines why deceptions occur—not only in advertising, media, but also in social and business interactions—and suggests ways to detect them. He also provides strategies for surmounting the barriers to truth: our willingness to believe what we want to believe; the absence of accurate information; and the rise of the professional spinmaster. Bob Levin ’79 is coeditor of Work Meets Life: Exploring the Integrative Study of Work in Living Systems (MIT Press, 2011). The book is the result of seven years of cooperative effort between researchers at the University of Colorado and at Darwin College, University of Cambridge. “The content and approach of the volume comes very directly from the research I started with my Reed thesis, and two of the contributed chapters specifically pick up where my thesis left off.” Bob cites his thesis adviser, Steve Arch [biology, 1972–] and Christine Mueller [history and humanities, 1973–2004] as guides and inspirations. Bob is director of the Center for the Integrative Study of Work at the University of Colorado. This is his fourth book. An Anthropology of Ethics by James Faubion ’80 (Cambridge University Press, 2011), with a cover illustration by Vera Sideraki ’90. James conducts an empirical inquiry into the ethical domain through a critical revision of Michel Foucault’s investigation of ethics. He argues that Foucault’s approach is a productive point of departure but needs substantial revision to be of genuinely anthropological scope. James illustrates his program with two case studies: one of a Portuguese marquis and the other of a dual subject made up of the author and a millenarian prophetess. The result is a conceptual apparatus that is able to accommodate ethical pluralism and yield an account of the limits of ethical variation, providing a novel resolution of the problem of relativism that has haunted anthropological inquiry into ethics. A Spanish translation by David Berrigan ’83 appeared in the magazine S/N New World Poetics. David translated The Sonnets, which were written by his father, Ted Berrigan. Living with Koryak Traditions: Playing with Culture in Siberia (University of Nebraska Press, 2011) by Alex King ’91 examines the culture of Koryak people, who live on the Kamchatka Peninsula in northeastern Siberia. The Koryaks have been in the middle of contradictory Soviet/Russian colonial policies that celebrate cultural difference across Russia yet seek to erase those differences. For most Koryaks, tradition does not function simply as an identity marker, but also helps to maintain moral communities and support vulnerable youth. Alex also makes innovative arguments about theories of tradition and culture for anthropology. Jousting Armadillos & Other Equations: An Introduction to Algebra by Linus Rollman ’96 (Arbor School of Arts & Sciences, 2011). Linus wrote this nontraditional textbook to make algebra accessible to students who don’t intuitively gravitate toward math. He has been teaching math at the Arbor School in Tualatin, Oregon, for 11 years.